The bigger firms and business venture use proxy for SEO. This is extremely important in ensuring that you are not blocked from websites. Understanding this is quite simple and easy. Take the example of different social media accounts. If you use different accounts to manage your marketing unit, you may be detected as a spammer. If a website detects your IP address, your marketing may suffer. Hence, if you do not wish to be blocked, you should use a proxy for SEO. How to make use of a proxy for SEO? 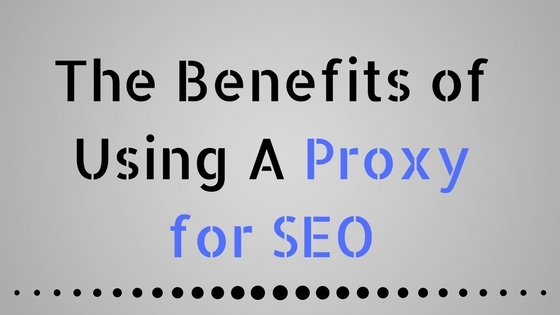 The best way to make maximum use of a proxy for SEO is to buy reliable proxies. This will enable you to surf safely over the internet. Moreover, you competitors will not be able to detect your presence on their web. You can even surf the banned websites. The proxies will boost your SEO by enabling you to surf safely. It will look like you are surfing from a different country. In addition to covering your tracks, your marketing issues will also be resolved. It is extremely beneficial to use proxy for SEO. Also, you will be safe from the denial of service threat. Too much traffic from one IP address can become a problem in the long run. Websites will soon be banning you if you do not use a proxy for SEO related browsing. Therefore, it is highly advisable to carry out your SEO tasks while using proxies. Essential information about proxy for SEO? Some of the key facts that you should know include the proper usage and implementation of proxies. If you want to know which keywords are hits, you should surf with proxies. In case your client is from another country, you will need a wider internet coverage. This is because different countries show different search results. To be sure that you provide the best service to your client, you need to use proxies. This will ensure that you have the best services for yourself. Using a proxy for SEO is one of the easiest solutions. The SEO based proxy packages are advanced and highly reliable. If you choose the right thing, your SEO related issues can easily be solved. It is important that you have information about right packages. Those who have clients from different countries should definitely use a proxy for SEO purpose. Microleaves provides proxies for a variety of purposes. The SEO proxies are also highly reliable and widely distributed. The IP address is unique and untraceable. The SEO freaks can use an IP address that makes it look like they are browsing from another country. Moreover, it is also possible to enhance business and get more clients. If you use Microleaves proxy for SEO, you can boost your business by many folds. So, choose what is reliable to get the best experience. In conclusion, the use of proxy for SEO is a need of the time. Be it competitive business, safer browsing or increased connectivity, it is all covered. It is an attractive deal and also very reliable. If you wish to remain upbeat in the business market, you have to increase your online presence. The use of proxies is the best way to ensure this. So, choose wisely to ensure that you choose the absolute best.